Inspired by these great stories, I am ready to start my professional blog with the review of the past year. For those who don’t know, I am the co-owner and CEO of ProteusThemes, WordPress theme company founded in 2012 out of curiosity, excitement, and challenging myself. One paragraph of background: I built my first website in 2004 and made one for money only a year later. But until 2013 all the earnings from building websites were my pocket money. ProteusThemes is my first company, founded in early 2013. After very successful 2014 and 2015, 2016 was a year when the things that I’ve taken for granted started to collapse. At first, I was very worried and under lots of pressure because of it. In the second part of 2016, this lead to many stressful days and sleepless nights. Now I look back, I also see that besides these negative effects, it was also a lesson from which I have learned (and still learning) a lot. So, how we did in 2016 and the lessons I have learned as a WordPress business owner? With the last (2015) New Year we’ve moved into our own office. Till then we’ve been working remotely and from two different co-working spaces. This has been a huge milestone for me and for us. We’ve been paying rent for 2 months, but in March there was an opportunity and I was able to buy the office space from the Technology part of Ljubljana. About 55 square meters, just right for our growing team. It was a perfect investment at the right time and laid solid foundations (literally) for us to grow in the future. ProteusThemes started as a designer-developer combo, but before the company was one year old, the first employee Marko joined the team, to help with support and frontend development. At the beginning of 2016, we were a team of 6 and we’ve closed the year as a team of 7. So who joined and who left? Lena Gregorčič helped us with many not-so-technical things for about a year and a half. Due to her past skills working with WordPress, she was able to handle a large portion of non-technical support requests and coordinate the rest of the questions from our clients to us developers. She also took care for ProteusThemes’ social media profile, newsletters, and blog. She did an amazing job on research for the support platform, prepared the wireframes and concepts that we’ve put then into action. I was very happy to see how this had a very positive effect on lowering the number of support tickets. In 2016 a side-project of her started to take off (she’s very passionate about dogs), she wanted to put more focus on it and we said farewell to each other in April 2016. I am very grateful for all things she did for ProteusThemes and we continue to be in touch; for ProteusThemes, local WordPress meetups and in personal life. Maruša Barle joined the team about the same time when Lena left. She applied for the junior backend development position, but after 2 months we’ve both agreed that it might take a little bit more time to get there. She stayed with us as a part-time employee and takes care for the majority of support requests. For the last 2 months, she’s been taking a node.js online course and I am personally very excited to see how she will be able to leverage this new knowledge in the future. Matthew Knight joined the team in June. He is from UK and it was a big relief to have a native English speaker on board. However, Matt had no prior experiences with WordPress before joining our team, so I’ve committed myself to help him learn it. I hired him for the marketing, at that time especially for the content marketing. He helped us grow our Twitter following by 10x in relatively short timespan, revised all our copy, demo sites, wrote lots of fresh posts on our blog and prepared a copy for our new website. However, after our new website went live, there was not that much work anymore for him for our themes’ copy. Regarding content marketing, it’s much harder to learn someone enough about WordPress that he’s able to create a content on his own than I anticipated. As the things didn’t work anymore, he left our team at the beginning of this January. Matt, I wish you all the best in your future career! Jaka Šmid and Jaka Jejčič keep designing. Marko Prelec keeps being frontend developer, but lately, he started helping me a lot with the marketing. Gregor Capuder keeps rocking in PHP and getting better every day with JS. In 2016 I was faced to make some unpleasant decisions about my team. I am not the type who loves to tell the people they are fired. But at the end of the day, I am running a business and no matter how I hate to do it, there is nobody else who will (or should) do it instead of me. It was my first experience of the type and now I look back I believe I did it in a professional manner and nobody was really hurt. On the bright side, I feel that opening our new shop and facing us with new challenges made us play together even better with Marko and Gregor. There were days when I was completely overwhelmed by all the stuff in my head and I was on the edge of going crazy. At these times the support by my team was something I am extremely grateful for. Here’s the problem: I am bad at delegating work I don’t like to other people. I rather take it all myself, than ask for help. This isn’t good for anyone, as then I end up doing all the stuff I hate alone, get overwhelmed by it and I cannot be productive and supportive for the rest of the team. I’ve learned the hard way that delegating the silly tasks is totally OK and I should let the people help me. That’s why we are a team. I need to commit myself to ask for help earlier. Thankfully, I am surrounded by people who are happy to help me and I can trust. ThemeForest is where we’ve started our business and it was our only source of income (except some custom client work) in the first 3 years. This changed in November with opening our ProteusThemes Shop (more about it below). In February 2016 we’ve crossed 1 million USD in total sales on the ThemeForest. This attracted some local media but didn’t have any significant impact on sales. Here are the sales statistics from ThemeForest by months. After the Shaka’s release, we’ve rolled up our sleeves and began a new journey. ProteusThemes is a consequence of an email I’ve sent to Jaka in August 2012. At that time I was using WP for the 6th year as a freelancer but never built a digital product for sale before. We knew little about WordPress market, except that ThemeForest is the place where the WordPress themes are sold and bought. Naive as we were, we’ve set ourselves to build a WordPress theme and sell it there. And boy, it worked! It worked so well that right after I graduated from astrophysics I was able to self-employ myself. We’ve created this premium WordPress theme from a void and started making serious money. We didn’t have any vision or strategy but rather decided to go with the flow and see where this brings us. In the first two years, we’ve been seeking for new small business niches that haven’t been covered well and create one hell of a nice and user-friendly WordPress theme for them. Ten different themes, with our clear best-selling winner to date – BuildPress. 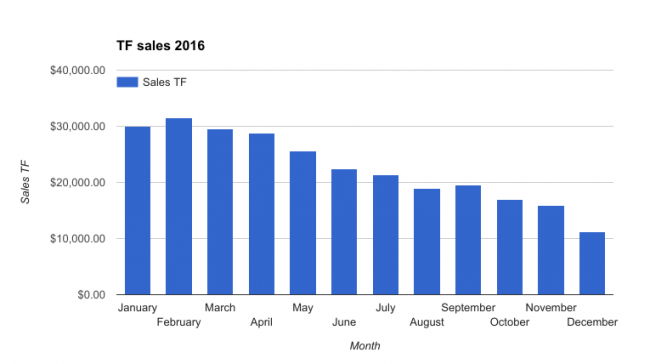 As can be seen from the graph above, I’ve started noticing a negative trend in sales from month to month in 2016. As the theme is getting older, usually the sale volume drops with time. We’ve always compensated this with releasing new themes. It is not the most clever way to compensate this, but surely the easiest and most straightforward. But last year this changed dramatically. We saw that only releasing new themes don’t have a positive impact as much as it did in the past. So we’ve decided to completely remake our old static HTML website and build our own WordPress theme shop. We’ve started working on first concepts in January, but devoted 100% of our focus from July on. In October we released our new website, and on November 23 opened the EDD-powered shop. In a little more than a month our new shop brought in $3,975, a large portion of it in the first 2 weeks when we’ve offered 50% discount. 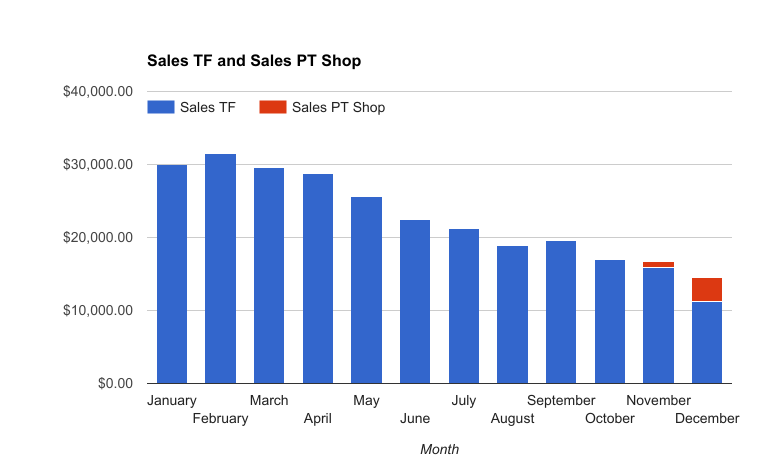 Here is the graph from above, with additional revenue from our own shop. What’s your timeframe to evaluate success? If it’s a year. Then the answer is almost always a big “NO” It takes a lot of time to grow. I think I have a lot to learn in the future about the marketing and how to position ourselves, but I can see a bright future already. We’re dedicated to bringing new, fresh ideas into life in 2017 and going our own path will help us make them true. I will stop right here and publish the 2nd part the next week, or it will be December before I make it live. Subscribe to my newsletter to be notified about it. Thanks for reading! Thanks for sharing this Primoz! Congrats on your new blog and office. Life is a hard pill to swallow, believe me, I had my fair share of issues last year. I did write about most of them. I consider, writing yearly reviews a good practice, it’s the best way to hold yourself accountable. There are a lot of changes happening in the WordPress space, especially among theme developers/shops. I suspect that trend you’re seeing is much more prevalent than you or I would like to believe – which unfortunately points to an unstable market. Carving your own bit of the market won’t be easy, but it’ll pay off in dividends over time. Don’t let the numbers get to your head – there’s still work to be done, and much more money to be made! Nice article 😁 would be great to see a half year follow up before your changes to monthly kick in.